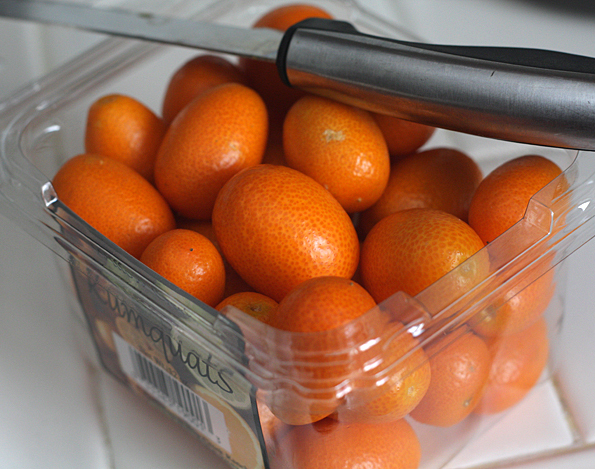 I love kumquats—the funny little bright orange citrus fruit that has a sweet peel and sour flesh. 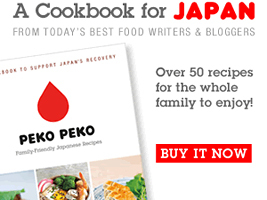 In Japan kumquats are a common site during winter and are often eaten candied. I LOVE them. When I saw a basket of them at a local market recently I had to have them. I haven’t had kinkan kanro-ni (Japanese candied kumquats) since we lived in Japan, and seeing those kumquats gave me a fierce craving for some. Kinkan kanro-ni are simple to make, but take a bit of time because you have to wait for the sugar syrup that you cook them in to reduce down. 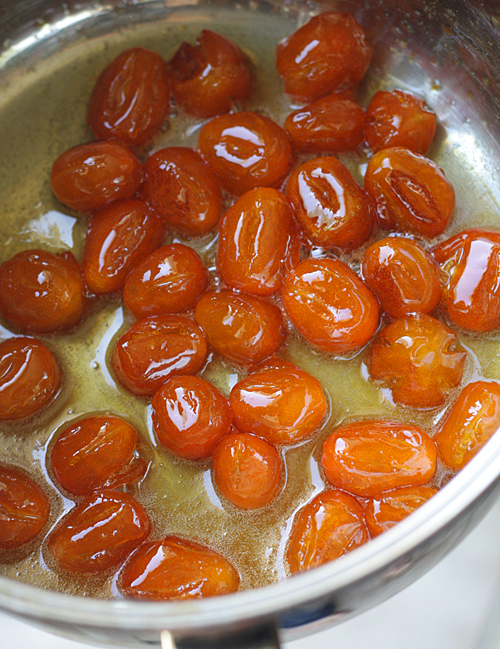 The method for making the candied kumquats that I’m familiar with uses a combination of granulated sugar and wasanbon, a very fine powdery Japanese sugar that is expensive and tends to be hard to find here in the US. I didn’t have any on hand, and I wanted to make the candied kumquats while the kumquats were still at their prime so I decided to try making them using only granulated sugar, which ended up working beautifully. I also added a some freshly grated ginger to the syrup to add a bit of spice. You start by washing and drying the kumquats and then use a sharp pairing knife to cut vertical slits into the fruit (between 5 to 8 slits depending on the size of the fruit). Then you boil them for a few minutes (if they are extra bitter, you repeat the boiling process), and then soak them in cold water. This boiling and soaking process helps to remove some of the bitterness from the flesh. 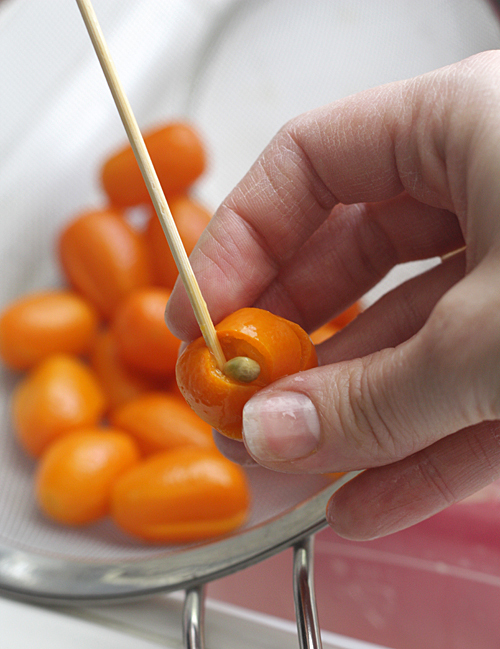 Then you lightly squeeze open the fruit and use a bamboo skewer to remove the seeds. Once that is done, you make a syrup out of sugar and water, add the freshly grated ginger and kumquats and let it all simmer, occasionally skimming off the white scum that collects on the surface. You continue cooking it until the fruit is shiny and glassy and the syrup has simmered down until it barely covers the fruit. Then all you do is transfer the fruit and syrup to a glass jar and store it in the refrigerator until you are ready to use it! In a tightly sealed container, the candied kumquats will keep for about 6 months in the refrigerator. Candied kumquats are delicious eaten alone, chopped up and added to breads and muffins, minced and sprinkled on top of ice cream, etc. I used a few of them to make a topping for Italian panna cotta. I thinly sliced a couple of them and then added some honey and water to make a very thin syrup, which I then drizzled over the top of the panna cotta. The slight tartness of the candied kumquats paired beautifully with the rich creamy sweetness of the panna cotta. I also loved the look of the bright orange against the creamy white of the dessert—very elegant looking. Paula of Bell’alimento has an incredibly easy (and incredibly delicious) recipe for panna cotta that is my go-to recipe. If you can boil water, you can make her panna cotta. Plus, it takes less than 10 minutes to make (and then a minimum of 2 hours in the refrigerator to set), so this is a great dessert to make when you don’t have hours to spend or you need something that can be made in advance. 1. Wash and dry the kumquats, then use a sharp pairing knife to cut vertical slits into the fruit (between 5 to 8 slits depending on the size of the fruit). 2. Bring a pot of water to boil, add the kumquats, and boil them for three minutes. If they are still very bitter, repeat the boiling process with fresh water. 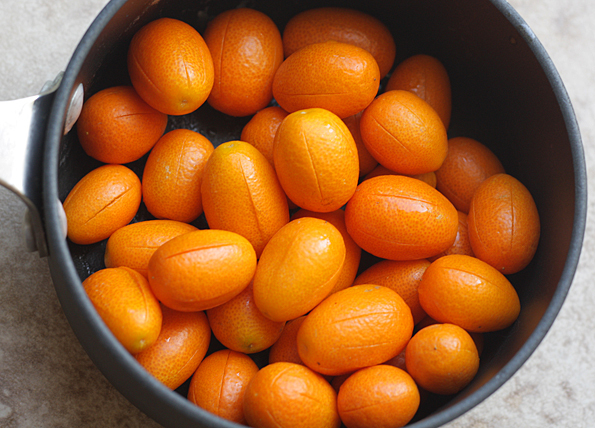 Soak the boiled kumquats in cold water for 5 minutes and then drain them. 3. Lightly squeeze open the fruit by pinching it open between your thumb and forefingers and use a bamboo skewer to remove the seeds. 4. Bring the 1 1/3 cups of water to a boil and stir in the sugar. When the sugar has dissolved, stir in the freshly grated ginger and the kumquats. 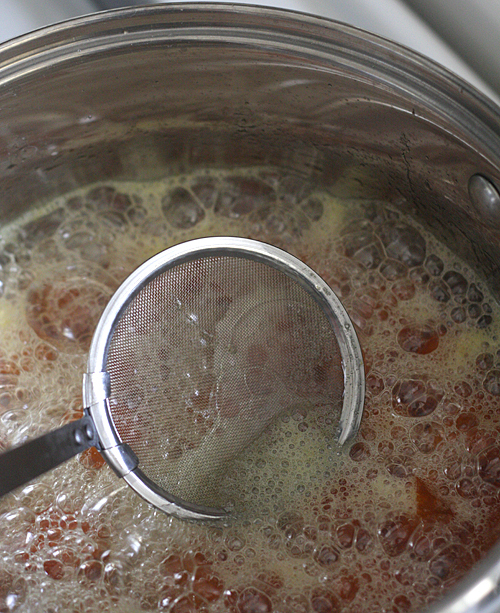 Reduce the heat to low and simmer, occasionally skimming off the white scum that collects on the surface. 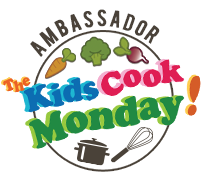 Continue to simmer until the fruit is shiny and glassy and the syrup has simmered down until it barely covers the fruit. Transfer the fruit and syrup to a glass jar and store it in the refrigerator. 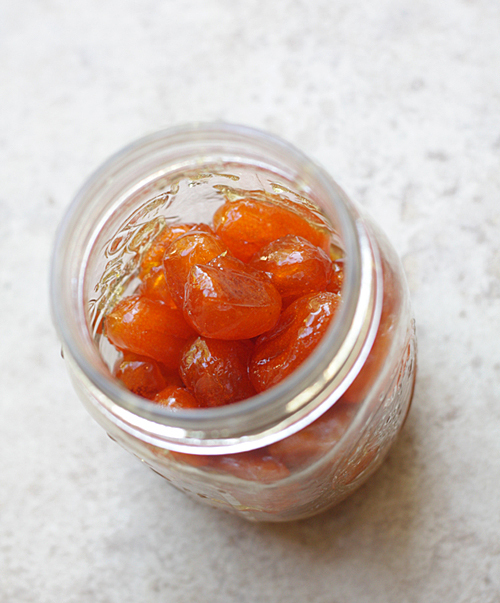 In a tightly sealed container, the candied kumquats will keep for about 6 months in the refrigerator. 1. 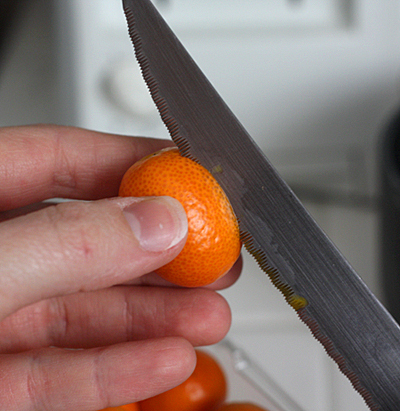 Thinly slice the kumquats with a sharp knife. 2. Mix the honey and water together and then stir in the kumquat slices. Spoon over panna cotta when you are ready to serve it. Those candied kumquats are amazing! 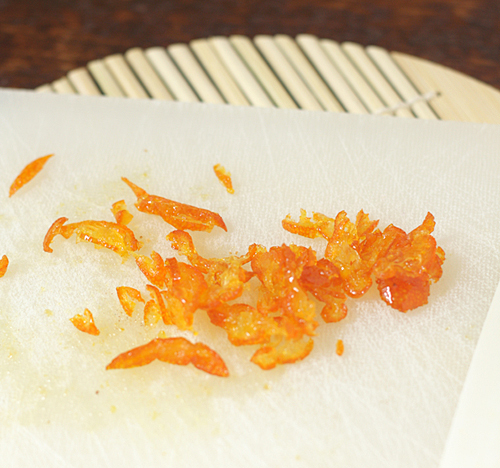 candied kumquats are delish! great photos! i miss my kumquat tree. Oh. My. God. They look delicious. What do you do with the syrup they were cooked in? I really like tapioca pudding made with pearl tapioca and I bet they would go well with that. Thanks Elsie! You put the syrup in the jar with the candied kumquats. A spoon of it is delicious stirred into a cup of hot herbal mint tea. Those look so cool, I’ve never had a kumquat although I’ve seen them before (for once! heh). You eat the peels too, right? 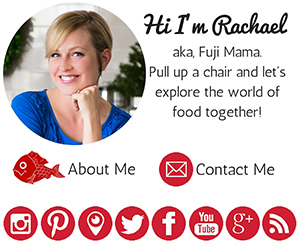 Okay now I wish I had picked up a container of kumquats at the store this morning : ) Gaw-geous Rachael! I will say that I’m not a fan of kumquats, but this recipe makes me rethink that. It’s gorgeous and simple….Wonderful to have on hand. And putting the syrup in tea — that sounds amazing! These are beautiful ! I just bought some kumquats the other day because the Nuni had never tried them — I was actually kind of surprised that she seemed to like them. But now I want to candy them. What a fabulous display!! I do so enjoy your posts Rachael. 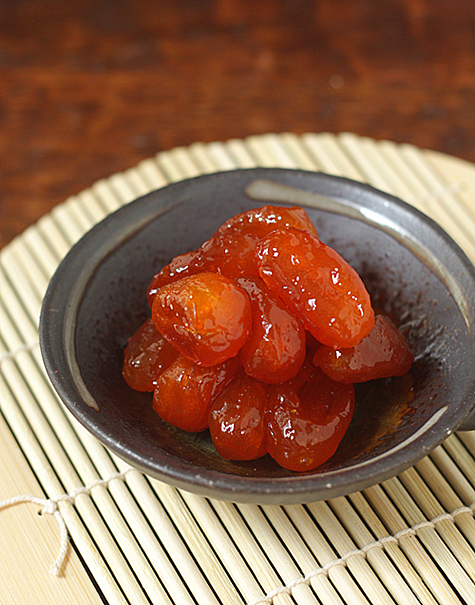 There is always something “new to me”, like these Japanese candied kumquats. 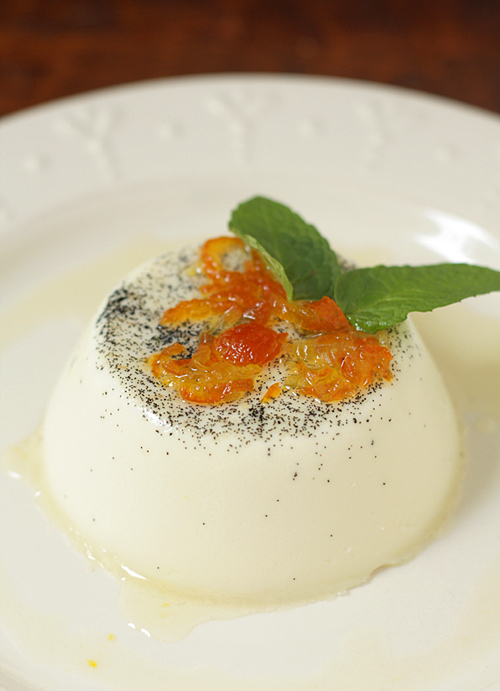 Now I’ll be craving Panna Cotta and wondering how divine those kumquats would be on top! Excellent and beautiful – I need to make me some of those babies! Absolutely beautiful and so innovative! I am in love with those little kumquats. Wow, I just ate some of that stuff. The panna cotta is really good. The cumquats go perfectly with it. Definitely a keeper. I have never heard of these, but they sound really great! Thank you! I love panna cotta, but have never had this combination. I will have to get some kumquats and give it a try! The glossy shine against the tantalizing deep orange color is simply irresistible! What a beautiful addition to a classic dessert! Great post! I’m really impressed with the effort you went through to make this! I had no idea it was so complicated. How beautiful! 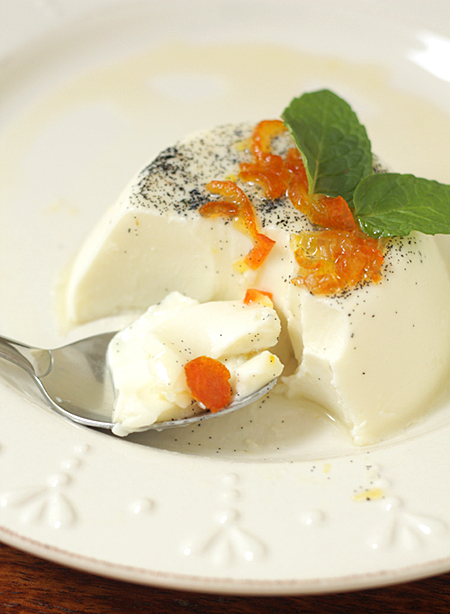 Even though I am not a kumquat fan, this might convince me… I just coaxed a friend into giving me her “go to” panna cotta recipe and can’t wait to try it out in warmer weather…. Is the candied kumquats and honey the same that the Iron Chef used in The Horsehair Crab Battle? A Iron Chef video section 2 & 3 mention Kinkan & honey for sauce. It’s said they usually use sauce on pork roast. If it is, can you please let me now. Contact me on my email. Spaghetti Carbonara » Blog Archive » So help me god, I will run you down with this two-thirds sized shopping cart. Ode to the Kumquat / Blog / Need Supply Co.